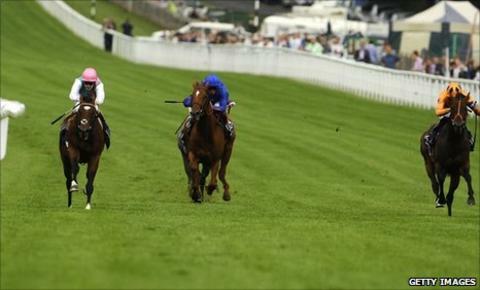 The Sir Henry Cecil-trained Frankel made it eight wins from eight races with victory in the Sussex Stakes at Glorious Goodwood. Jockey Tom Queally moved the favourite to the front in the first few strides and never relinquished the lead. Five-time Group One winner Canford Cliffs followed the leader closely up until the final furlong when Frankel surged clear to win by five lengths. The three-year-old adds the crown to his 2000 Guineas win this year. Trainer Cecil, who has now trained six winners of the Sussex, was delighted with the victory. "I thought he would win easily but didn't want to say. I have too much respect for the others," he said. "I think Frankel is the best horse I've ever seen, with Blushing Groom and Shergar. I can't go further back than that as I wasn't around," added the 68-year-old. Jockey Queally said he had to alter his tactics early in the race. "He's absolutely amazing. He settled well today," said the 26-year-old Irishman. "He picked himself up furlong by furlong. Plan A was to stay behind and stay relaxed. But (at the front) I kept squeezing him away and he kept finding. It's a fantastic day." A cash prize of £170,130 takes Frankel's career earnings to more than £800,000. Godolphin's Rio De La Plata, with Frankie Dettori on board, almost caught Canford Cliffs on the line but the 22-1 chance had to settle for third. French-trained Rajsaman finished fourth and last. Richard Hannon, trainer of Canford Cliffs, believes the racecourse did not suit his four-year-old, despite the horse winning the race last year. "I don't think Goodwood is his track. He doesn't like going downhill, so we'll see," he said. "We scoped him and blood tested him and everything is perfect inside. "I wouldn't be worried on a decent track to have another go. We'll have to go home and rethink it, but I'm sure it's the racecourse. "Either Frankel is just unbeatable or we should have been closer."